Homemakers are too busy with their daily activities that they will appreciate anything that can make their work easier and faster. Take for instance, food preparation and storage. With a vacuum sealer, they can slice up an array of deli meats and cheese for a party and then keep the food items fresh for an extended period. It then allows them to work on other things in the kitchen, or spend more time with their families. Vacuum sealers remove air from a food package. 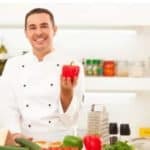 The removal of air prevents the development of bad flavors on the food as well as affecting its colors, according to the National Center for Food Preservation at the University of Minnesota. Vacuum sealers aren’t just for food. You can also save your silverware in vacuum sealed bags to spare them from losing their luster. Some people even seal their important documents such as marriage or birth certificates. These documents can be saved from deterioration using a vacuum sealer. If you are a neophyte user of vacuum sealers, then you will find this unit a great fit for your kitchen. It is very easy to use even to a person who hasn’t operated a vacuum sealer. To use this, simply put the food into the pouch and put it on a flat surface. Place the suction nozzle of the unit over the sealer valve on the pouch. Then depress the zip-seal button to activate the suction function, and then release the button once all the air has been removed. Once the air removal is finished, press the center of the valve to complete the sealing process. Aside from being easy to use, this unit won’t take up a lot of space in your kitchen. In fact, its footprint is about that of a computer mouse. This is a highly recommended vacuum sealer. In fact, there are very few complaints about the unit itself. One common concern is that it can be tricky to line up the valve at first. But in order to be an owner of this very good vacuum sealer, you will have to pay more. Compared to other vacuum sealers, this one is very costly. In fact, it is up to three times more expensive than most vacuum sealers in this list. Despite the very prohibitive price tag, this is still one of the best handheld sealers that you can get for use in the kitchen. 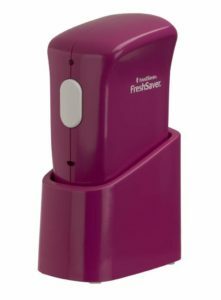 This is a cordless, compact, and lightweight unit that you will find ideal for keeping deli meat and cheeses fresh. It is easy to use as well, as it can remove air and create an airtight seal with the press of a button. Its nozzle is dishwasher-safe, thus cleaning it should be a breeze. The nozzle also catches overflow liquids. Another thing you would love about this vacuum sealer is that it doesn’t take up a lot of space in the kitchen. It measures just 4 x 3 x 9 inches (length, width, and height). You can find space for this tool even if you have a small countertop. There are two medium zipper bags included in the package. The price is also very low which makes it very much a highly recommended item. In fact, it is one of the cheapest vacuum sealers on the market today. The fact that the battery is rechargeable means you don’t have to buy or look for the typical AA or AAA batteries. However, there are reports that the rechargeable battery doesn’t last long. It’s also a bummer that you can’t replace it, which means you’ll eventually end up buying a new vacuum sealer. Another common complaint is that the replacement FoodSaver zipper bags are quite expensive. However, most reviews indicate that the zipper bags are of good quality. Don’t think that this professional vacuum sealer is designed for use of chefs. Even simple homemakers will be able to use this pistol-styled vacuum sealer. It’s relatively easy to use. Simply put your food in the bags provided then use a zip lock to pack them. Pick up the sealer, insert the nozzle into the reed valve, and push the trigger. The tool then starts to remove the air out of the bag. Once the nozzle has removed all the air, the bag is ready to be stored in the ref or freezer. This vacuum sealer is also easy to clean. Simply remove the two parts separately and then use a wet cloth to clean it. The device has a small, rechargeable battery that can enable the vacuum sealer to seal up to 30 bags. This cordless vacuum sealer is also a good companion during fishing trips. You can seal in your catch right away using this device. Of course, there are drawbacks as well. One is that the replacement bags are pretty expensive, aside from being difficult to find in retail stores. You may reuse the bags but you will eventually have to replace them down the road. Moreover, the soft rubber suction cup isn’t really sturdy. Many reviewers complain that it can easily wear out over time. Compared to the other vacuum sealers, this is a slightly bigger unit. However, it still won’t take up a lot of space on the countertop with its size of 11.7 x 7.2 x 4.6 inches (length, width, height). It can still fit in a drawer. With its fuchsia colored body, this vacuum sealer has the good looks that can impress any homemaker. The starter kit has everything you need to get things started. There’s a charging stand for recharging the vacuum sealer battery, a deli container, five 1-quart zipper bags, and another set of 1-gallon zipper bags. Like the other vacuum sealers in this list, this handy unit is very easy to use. 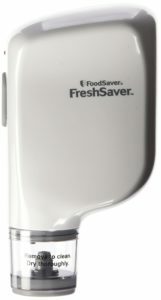 Many reviewers also have good words to say about FoodSaver, commending its customer service in particular. They say that the firm will immediately replace units that suddenly lose suction. The unit is also reasonably priced. But its battery is also not replaceable, so there’s a risk you may have to buy another unit when the battery conks out. Also, the vacuum sealer may not be able to remove air in bigger containers. Moreover, there are complaints from Amazon.com reviewers that the bags easily lose their suction tabs. Additionally, the replacement of the bags is very expensive. This vacuum sealer has five bags of different sizes. There’s also a base where you can put the sealer when not in use. The base allows the device to stay on your countertop. It’s relatively easy to use despite it having an instructional manual that is in English.To be able to use it, you should have six AA batteries which aren’t included in the package. Many reviews suggest that the bags included in the package are durable and thicker than generic bags you can buy at retail stores. The bags can be rinsed out and reused a few more times. It is made of durable plastic that doesn’t wear out easily. It’s also easy to use. It would take around 10 seconds to remove the air, depending on the amount of air in the bag. Once you have put the food in the bag and zip it, you simply have to place the head of the vacuum to the circle label. The sealer then vacuums out the air. Aside from being compact and easy to use, the vacuum sealer is also very cheap. However, some reviewers are not impressed with the product. They say that the vacuum’s suction is a bit weak. Others say the build quality isn’t topnotch. You can choose from an internal vacuum sealer or an external vacuum sealer. The former is a bit more expensive and is better equipped to remove air. The main difference, however, is that everything from the vacuum creation to the bag sealing happens inside the sealer. This is more appropriate for high volume sealing. On the other hand, an external vacuum sealer only needs the bag opening to go into it. Most of the bag is kept outside of the appliance. This is more appropriate for household chore as it is cheaper and easier to use. You should also consider your skill level when shopping for a handheld vacuum sealer. If you are technically-challenged, an external vacuum sealer is the better fit for you. It’s easier to use. You simply have to fill the bag and put it inside the vacuum channel. 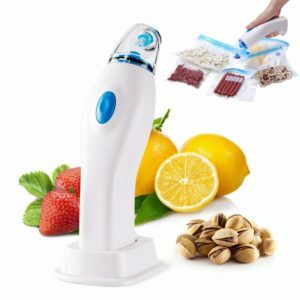 But if you have experience in using vacuum sealers, then you may buy the internal sealer. This is considered to be the more advanced type of sealer. You can look for a unit that can allow manual changes in air levels to be removed. Your choice will also depend on your packing requirements. If you think you will be packing high volumes of food, then the internal or chamber vacuum sealer. 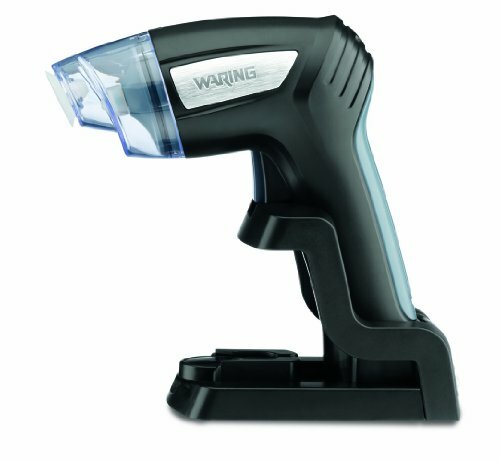 It seals faster and can handle a greater workload. On the other hand, an external sealer is more appropriate for smaller tasks. It also gives you more control compared to chamber sealers. Like in any other purchase, the price could be the deal breaker in your buying decision. 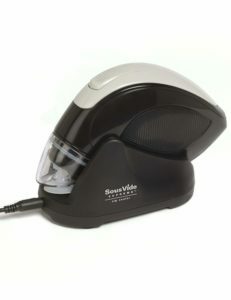 Prices of handheld vacuum sealers vary depending on the design and technology used. Some devices are very expensive due to their superior features and high-quality materials. These units are best suited for professionals like chefs. However, if you consider yourself a regular homemaker, a simple handheld sealer that costs a few dollars may suffice. Having a vacuum sealer in the kitchen can make your life easier. You can keep your foods fresh for a longer time by putting them in a vacuum sealed bag. You don’t have to worry about keeping the freshness of your favorite food items when you have a handheld vacuum sealer in your kitchen drawer. There are many vacuum sealers available online and retail stores, but I believe that I have shortlisted the five best sellers today. These are all user-friendly, and solidly built vacuum sealers. With the exception of the Sous Vide Supreme Zip/Vacuum Sealer, all items listed here are reasonably priced as well. Moreover, these handheld vacuum sealers are all compact. These handy devices won’t take up a lot of space in the kitchen. You will also have no problems storing them in drawers. In determining which of these units to choose, you should take into consideration several factors like your skill level and packing requirements. The price may also be a deal breaker. But no matter which sealer you buy, I guarantee that you will be able to store your foods well with these products.